You get the idea that this is a bad place right away. 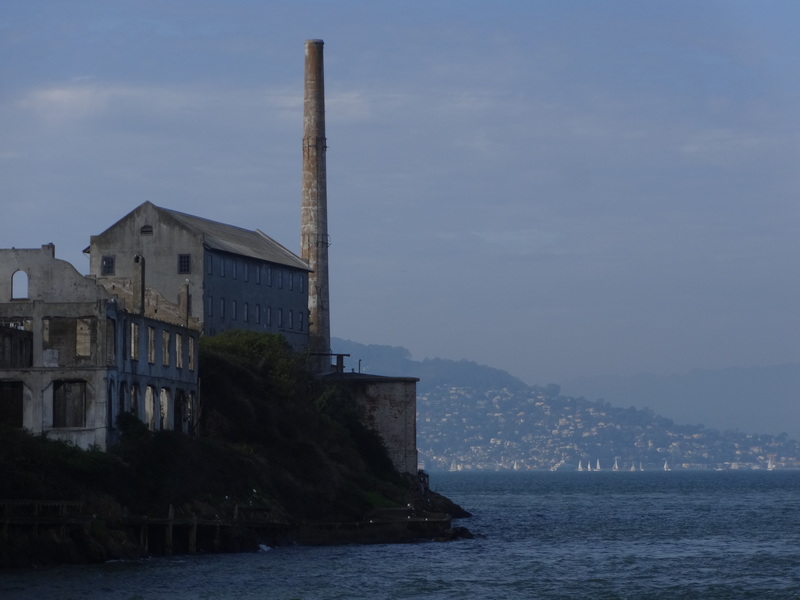 Alcatraz with Angel Island in the background. Discarded, but a black and white reminder of just how stark this place can be. 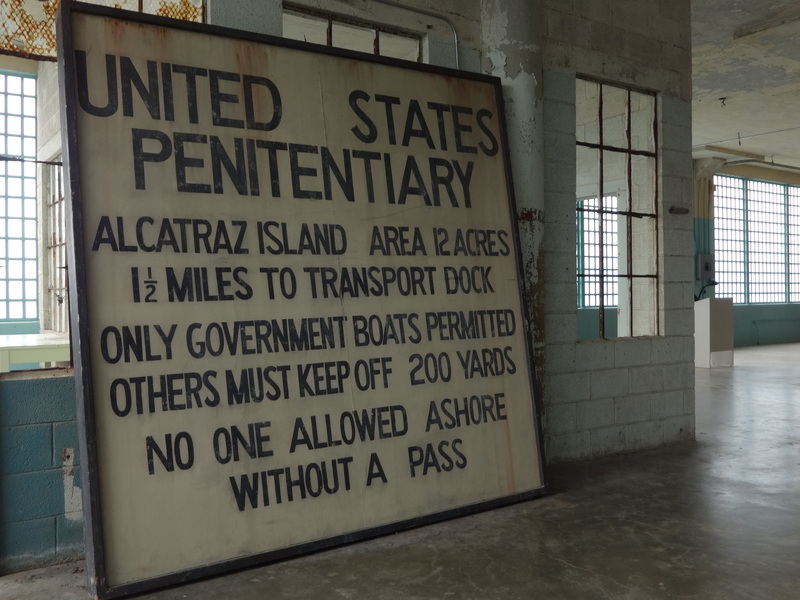 Set like what should be a jewel in the middle of San Francisco Bay, Alcatraz, the island, is nothing but rock and Alcatraz, the prison, nothing but misery. 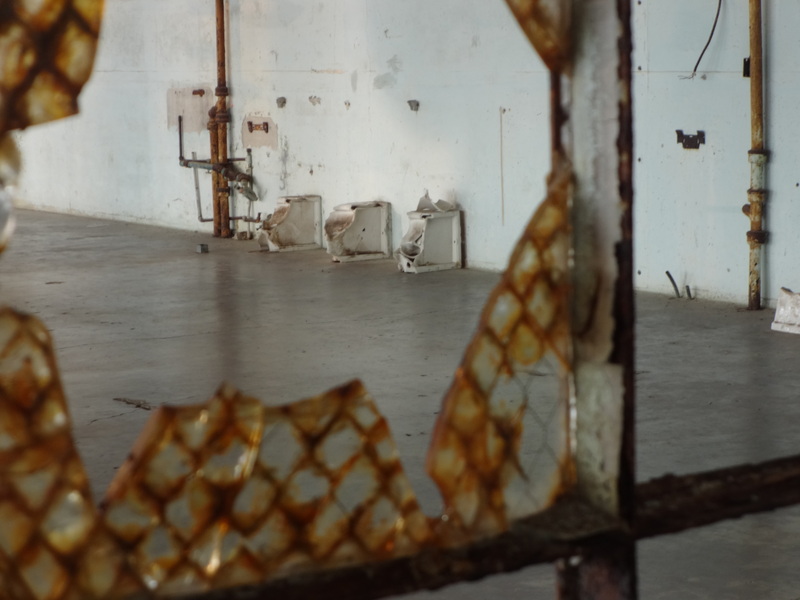 The free audio tour, with the voices of former guards and prisoners, recreates what it would be like to an inmate and it’s not a pretty picture. Cells are tiny, places to roam or exercise or read are miniscule to non-existent. Ai Weiwei has been to jail. In China. For alleged tax-evasion. The two documentaries about him, Ai Weiwei: Never Sorry and Ai Weiwei: The Fake Case, give a vivid sense of his art, politics, humor, decency, integrity and status as a thorn in the side of a near totalitarian government. He can’t leave the country but this exhibit exploits that fact. He has created an installation of multiple works that remind us how international and relentless the pressure on political dissent is. 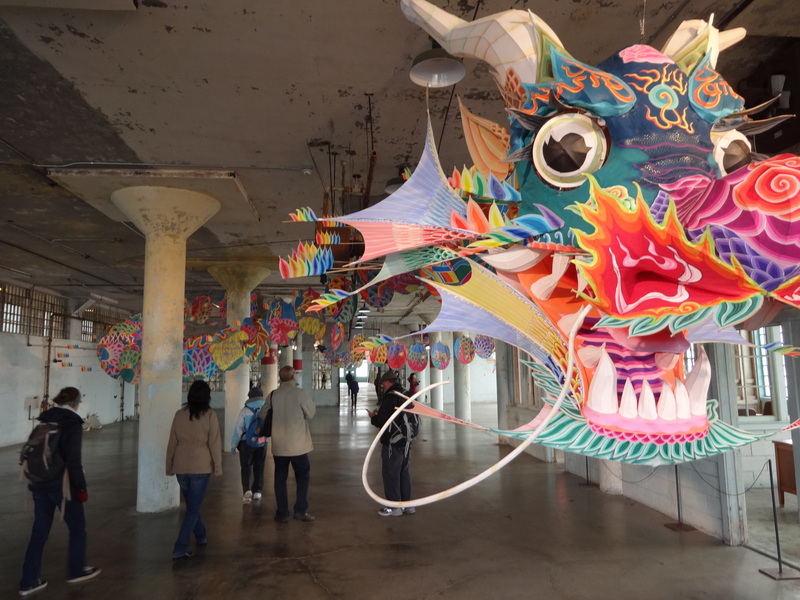 From the colorful dragon that snakes through half of the building where prisoners were allowed to work to the Lego-based images of scores and scores of political prisoners around the world, Weiwei draws us into a world we would rather forget and reminds of just how high a price dissent, protest and militant activism often entails. The dragon’s head wlecomes us to the former prisoners’ “work” area. A reminder of the thin line between in and out, free and captive, liberty and oppression. 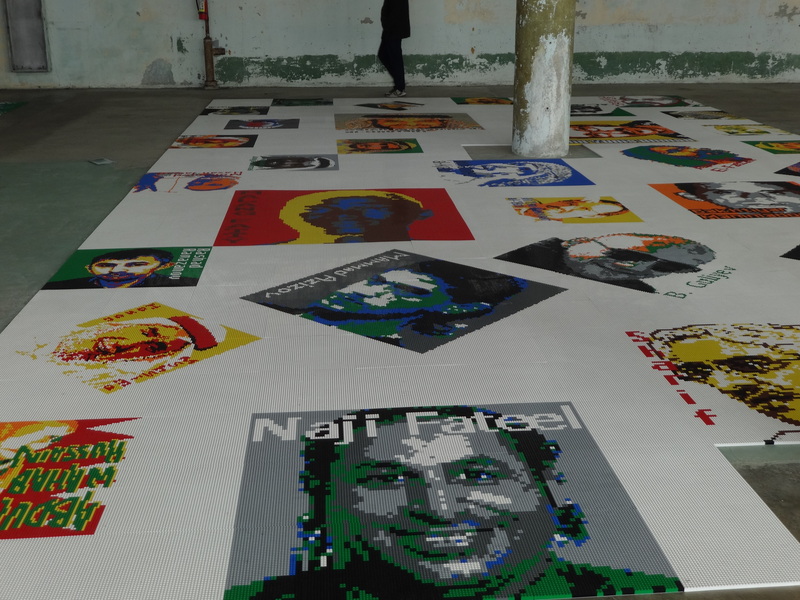 The Lego images are of far more people than most of us have heard of; Weiwei has culled them from around the world. The small pieces of interlocking tessera reassemble people whose lives have been torn apart, whose existence has been minimized and whose identities have been demonized. 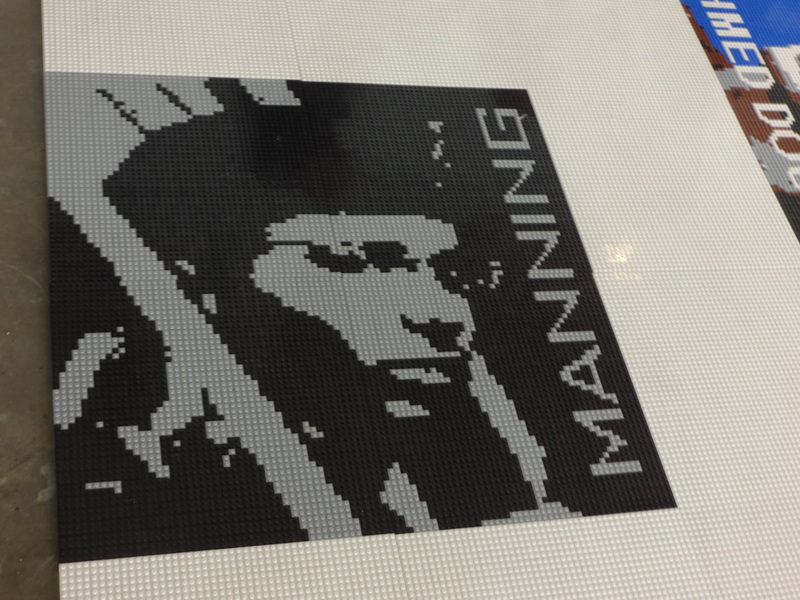 Some are prisoners no longer such as Nelson Mandela, while others, like Chelsea Manning and Edward Snowden occupy liminal spaces within or beyond prison walls. Weiwei gives them a vivid, fractured presence that we must actively reassemble and integrate in our own minds as we wander in this desolate workspace, a void in the spirit world of life. One of the large arrays of images in the work space. There are five such arrays in all. Chelsea as she might be seen today were she not in prison for helping expose the secret acts of our government’s war on civil liberties and privacy in the name of a war that seems to perpetuate the very thing it seeks to eliminate: terrorism. 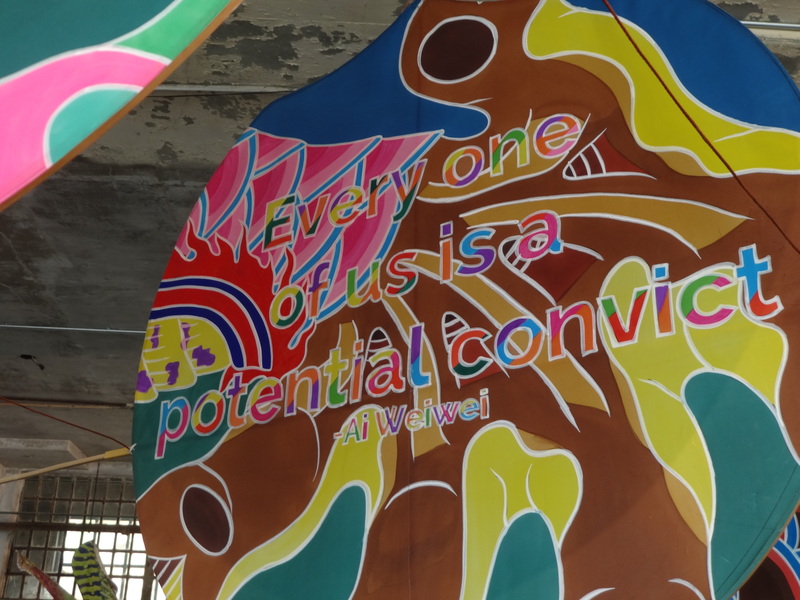 This entry was posted in Art, In My Opinion: The World Around Us and tagged Ai Weiwei, Alcatraz, dissent, documentary film, political prisoners, prison, prison art by billnichols99. Bookmark the permalink.